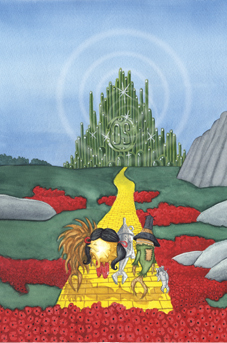 3.7 Song: "The Wizard of OS"
Go to the pub/OpenBSD/3.7/ directory on one of the mirror sites. Have a look at The 3.7 Errata page for a list of bugs and workarounds. See a detailed log of changes between the 3.6 and 3.7 releases. This is a partial list of new features and systems included in OpenBSD 3.7. For a comprehensive list, see the changelog leading to 3.7. Expanding the arm porting effort by supporting the Sharp Zaurus SL-C3000, bringing a secure ssh-capable machine to your pocket. A 64-bit port supporting O2 machines with R5000, RM5200, RM7000, R10000 and R12000 CPUs. Support for a number of much faster 64-bit machines (in 32-bit mode) in the OpenBSD/hppa port. New ath(4) driver for Atheros IEEE 802.11a/b/g wireless network adapters. New iwi(4) driver for Intel PRO/Wireless 2200BG/2225BG/2915ABG IEEE 802.11a/b/g wireless network adapters. New ipw(4) driver for Intel PRO/Wireless 2100 IEEE 802.11b wireless network adapters. New atu(4) driver for Atmel AT76C50x USB IEEE 802.11b wireless network adapters. New ral(4) and ural(4) [USB] drivers for Ralink Technology RT25x0 IEEE 802.11a/b/g wireless network adapters. New rtw(4) driver for Realtek 8180 IEEE 802.11b wireless network adapters. Added support to re(4) driver for Realtek 8169 CardBus Ethernet adapters. New udav(4) driver for Davicom DM9601 USB Ethernet adapters. New vge(4) driver for VIA Networking Technologies VT6122 PCI Gigabit Ethernet adapters. New piixpm(4) driver for the Intel PIIX Power Management controller. New ubt(4) driver for USB Bluetooth adapters. Many enhancements in the OpenBSD/mac68k port. Switch to a bsd.rd-based install. Add mc(4) support and enhance zsc(4) support. ospfd(8), implementing the OSPFv2 routing protocol. getcap(1), providing easy access to the capability database. Repaired mirroring mode in ccd(4). Bash-style prompt expansion and POSIX hex and octal constants in ksh(1). Reentrant getproto*_r(3) and getserv*_r(3) functions. pim(4) (Protocol Independent Multicast) support added. ntpd can now set the time immediately on startup itself, eliminating the need to run rdate -n beforehand. Use median instead of average when collapsing all the peers' offsets into one, greatly improving resistance against falsetickers. Calculate rootdelay, stratum, and precision properly; include these in replies sent out in server mode. Many logging improvements: ntpd is now almost completely silent in normal operation (unless in debug mode, of course). Allow sessions to depend on a CARP interface's master/backup state, reducing failover times in redundant setups. Lower latency for requests from other peers or bgpctl while under heavy load, e.g. initial table transfer when a session comes up. Allow for the peer descriptions to be used in bgpctl commands where previously only their IPs were allowed. Allow bgpd to not prepend its own AS number and to not modify the nexthop on updates sent out. Show associated interfaces and their state on "show nexthop", to help pointing out why nexthops are invalid. Allow for relative metrics modification, i.e. "set localpref +20". Improved carp(4), new carpdev mode for IP-less interfaces. Support limiting TCP connections by establishment rate, automatically adding flooding IP addresses to tables and flushing states (max-src-conn-rate, overload <table>, flush global). Improved functionality of tags (tag and tagged for translation rules, tagging of all packets matching state entries). Improved diagnostics (error messages and additional counters from pfctl -si). New keyword set skip on to skip filtering on arbitrary interfaces, like loopback. Allow the Address, Network, or Netmask values of the "IPsec-ID" to be specified with an interface name or the keyword "default" (in which case the address is selected based on the default route). Improved NAT-T and DPD stability and interoperability. Allow the addition of spamtrap addresses to the spamd database using spamdb(8). Spamd will automatically blacklist hosts that attempt to deliver mail to a spamtrap address while greylisted. Major overhaul of the package format, simplifying common tasks like user creation. In-place updates of packages with pkg_add -r.
Progress meters, which make installing big packages a more pleasant experience. Reliable dependencies on shared libraries, including the base system. Over 3000 ports, 2800 pre-built packages. Many improvements for security and reliability. Cleaner source code for ksh(1), httpd(8), and many more programs. Local, remote and dynamic port forwards may be configured to listen on specific IP addresses. sshd_config(5) now understands "GatewayPorts clientspecified" to allow client-specified listen addresses in remote port forwards. The existing behaviour for "yes" and "no" is maintained. known_hosts files may be hashed to provide privacy if they are later disclosed. ssh-keygen(1) has additional modes to generate and manage hashed known_hosts files. Users will be warned of impending password and account expiry. Corrupt keys in authorized_keys are now handled gracefully. sftp(1) has speed improvements for "ls" and now uses libedit for command line editing and history. sshd(8) will now log the source of connections denied by AllowUsers, DenyUsers, AllowGroups and DenyGroups. AddressFamily option in sshd_config(5) now has an AddressFamily option to provide global control of IPv4 and IPv6 usage by sshd(8). ssh(1)'s multiplex (ControlMaster) mode has been improved and now provides additional capabilities such as checking if the master is alive, obtaining its process ID and requesting that it shut down. OpenBSD/i386 and OpenBSD/macppc now use gcc 3.3.5. OpenBSD/amd64, OpenBSD/cats, OpenBSD/macppc, OpenBSD/hppa, OpenBSD/sgi, OpenBSD/sparc64 and OpenBSD/zaurus now use DWARF2 (C++) exception handling. Play with your BIOS options to enable booting from a CD. The OpenBSD/i386 release is on CD1. If your BIOS does not support booting from CD, you will need to create a boot floppy to install from. To create a boot floppy write CD1:3.7/i386/floppy37.fs to a floppy and boot via the floppy drive. Use CD1:3.7/i386/floppyB37.fs instead for greater SCSI controller support, or CD1:3.7/i386/floppyC37.fs for better laptop support. To make a boot floppy under MS-DOS, use the "rawrite" utility located at CD1:3.7/tools/rawrite.exe. To make the boot floppy under a Unix OS, use the dd(1) utility. The following is an example usage of dd(1), where the device could be "floppy", "rfd0c", or "rfd0a". The 3.7 release of OpenBSD/amd64 is located on CD2. Boot from the CD to begin the install - you may need to adjust your BIOS options first. If you can't boot from the CD, you can create a boot floppy to install from. To do this, write CD2:3.7/amd64/floppy37.fs to a floppy, then boot from the floppy drive. The 3.7 release of OpenBSD/sparc is located on CD3. To boot off of this CD you can use one of the two commands listed below, depending on the version of your ROM. If your SPARC system does not have a CD drive, you can alternatively boot from floppy. To do so you need to write CD3:3.7/sparc/floppy37.fs to a floppy. For more information see this page. To boot from the floppy use one of the two commands listed below, depending on the version of your ROM. If this doesn't work, or if you don't have a CDROM drive, you can write CD3:3.7/sparc64/floppy37.fs to a floppy and boot it with boot floppy. You can also write CD3:3.7/sparc64/miniroot37.fs to the swap partition on the disk and boot with boot disk:b. Write FTP:3.7/alpha/floppy37.fs or FTP:3.7/alpha/floppyB37.fs (depending on your machine) to a diskette and enter boot dva0. Refer to INSTALL.alpha for more details. After updating the firmware to at least ABLE 1.95 if necessary, boot FTP:3.7/cats/bsd.rd from an ABLE-supported device (such as a CD-ROM or an existing FFS or EXT2FS partition). Boot MacOS as normal and extract the Macside "BSD/Mac68k Booter" utility from FTP:3.7/mac68k/utils onto your hard disk. Configure the "BSD/Mac68k Booter" with the location of your bsd.rd kernel and boot into the installer. Refer to the instructions in INSTALL.mac68k for more details. Setup a DHCP/tftp network server, and boot using "bootp()/bsd.rd". Refer to the instructions in INSTALL.sgi for more details. Using the Linux built-in graphical ipkg installer, install the openbsd37_arm.ipk package. Reboot, then run it. Read INSTALL.zaurus for a few important details. If you already have an OpenBSD 3.6 system, and do not want to reinstall, upgrade instructions and advice can be found in the Upgrade Guide. Note that most ports are available as packages through FTP. Updated packages for the 3.7 release will be made available if problems arise.